Functions and Application Methods of Bitumen Emulsions: Water Phase Section - GlobeCore Bitumen Emulsion. for construction and repairs of soft roofs. Because bitumen emulsions have much less viscosity in comparison to the regular bitumen in road construction, there is no need to heat the emulsions and mixes. In addition to all of the above, bitumen emulsions can be used in cold and wet weather. The use of hot bitumen mixes, even with addition of surfactant additives, do not allow for the necessary work quality. Because of such wide variety of advantages, bitumen emulsions are used more and more frequently. And that is why there is a demand for units mixing bitumen with water and different kinds of additives as necessary for the formulation. The UVB-1 is a partially automated unit which is composed of a few independent pieces, built on a single frame: a section for preparing the emulsion and a section for water phase preparation with single control device. Preparing bitumen emulsions usually consists of two steps: preparation of water phase and preparation of emulsion. The water phase is a water solution of emulsifier, reagent for transferring of emulsifier into ionic form (acidic reagents for cationic emulsions and alkaline for anionic emulsions) or other necessary components, which improve the properties of the emulsion. 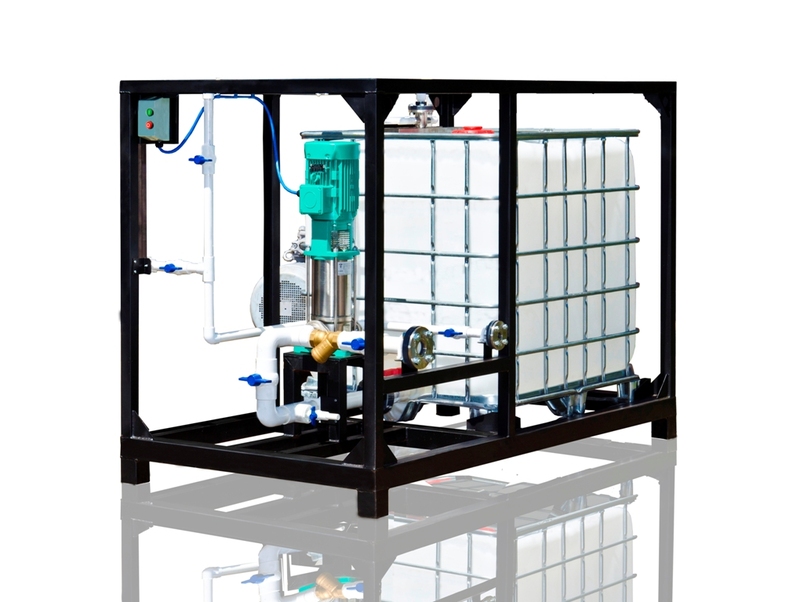 The water phase section is connected by piping with visual liquid consumption indicators and regulation valves, instruments and stop valves. Water phase is prepared in mixers in accordance with the proper formulation: volume, temperature, PH levels, and doses of components are preset. Fully prepared water phase and hot bitumen are dosed in a colloid mill for mixing. If necessary, bitumen can be thinned by spraying a thinner into the bitumen pipeline. Dosing of the components during water phase and liquefying happens automatically with the help of the pumps in the pipelines for continuous production of bitumen emulsion. For supply of water and blending there are vertical multistage pumps of different models. Supply of thinner occurs via a gear pump. Direct control of the component consumption is regulated by flowmeters in a wide range: up to 10 m3/hour for water, up to 4 m3/hour for blend, and up to 0.25 m3/hour for thinner. A variety of technologies in road, civil, and industrial construction require complicated types of bitumen emulsions via individual recipes. Lately it has become more common to use high quality bitumen mixe and emulsion preparation units. Based on trials and testing, brand new models and formulas appear for an even bigger effect in using the bitumen emulsions. In order to provide reliable and effective operation of electric grids without the need to use cables for each and every connection, various electrical equipment is used, one of which is oil filled power transformers. Due to its ability to transformer energy through relatively small conductors, the transformer has become an essential part of power generation and transmission, as well as the industry. By design, the transformer has several advantages, making it an efficient and reliable system to handle large amounts of electric power. Transformers are designed to comply with various operating conditions. A transformer is designed with two magnetic cores with secure windings. The cores and other internal components are protected inside an air-tight tank. The transformer tank is filled with oil, and is equipped with an expansion tank. The oil tank and the expansion tank help manage the change of oil volume with temperature, which is compensated by plastic deformation of a membrane. Another important part of the transformer is the air dryer. This device prevents moisture, dust and other foreign substances from entering the transformer tank. As mentioned before, the external structure of the transformer guarantees protection from the external factors. The lid of the transformer has a complicated system of magnetic locks and clamps. Above it, there is an expansion tank, connected with the oil tank by a pipeline. Gas relay is installed in the pipe. Harmful gases and oil wastes pass through the exhaust pipe of the transformer. A control lever with switches is located on the lid of the tank. Operation of the transformer is based on electromagnetic induction: inducing electric current in the closed circuit with a change in voltage. In the process, the electric current from the first layer of winding creates a magnetic field in the laminated core of the transformer, which then induces electric current in the second layer. The quantity of windings in the first and second protective layers correlate, lowering the voltage. That is why transformer oil is used not only for internal insulation but also for cooling of the transformer. Transformers are usually designed as compact devices to be used inside instrustrial structures or outdoors. A well protected tank is important for transformer operation. The transformer is also equipped with a thermometer to measure the temperature of the oil inside. Controlling the state of internal insulation of the transformer is essential to reliable operation. Transformers can be operated in a wide range of temperatures. The type of oil inside the transformer must comply with the temperature range. Generally, the temperature range of transformer operation is +40 °C to -60 °C. This makes it possible to operate transformers even in extreme Northern regions. The transformer must operate continuously and withstand the any voltage surge. The product of transformer operation is stable voltage output according to customer requirements. Certain principles must be followed for reliable and stable operation of the transformer. First and foremost, there are principles concerning the quality and purity of transformer oil. The amount and nature of contaminants initially and in continued operation must be carefully controlled at all times. It is also important to make sure that there are no potentially explosive materials near the oil transformers which could harm the outer protective layer of the transformer. Following these and many other regulations concerning the use of the transformer ensures long and efficient operation, as well as quality of the power output, protecting the operator from unforeseen damage costs. The density of transformer oil is one of its most important physical characteristics which in turn determine the quality of the oil and its functionality. Transformer oil density depends on the manufacturer, but can rarely exceed 900 kilograms/meter3 at 20 degrees Celsius. The definition of density is the ratio of its mass to its volume. The higher the temperature, the lower the density of the oil. In the local market, the standard range of oil density varies between 840-890 kilograms/meters3 and depends on its chemical composition. Among other factors, such as heat capacity, thermal conductivity, viscosity (kinematic and dynamic) etc., density of the transformer oil characterizes its functionality and indicates how well the oil performs. The requirements to transformer oil operation as electrical insulation, heat dissipation, arc extinguishing medium, as well as the medium protecting the core and solid insulation from moisture and air, are laid out in technical literature and documentation. In addition, the density of transformer oils is the basic indicator for calculating other characteristics. Kinematic viscosity or specific coefficient of internal friction is the ratio of dynamic viscosity at a given temperature to density. Viscosity of any liquid, oil included, characterizes the resistance of moving one portion of the liquid relative to the other. Viscosity of the oil is a parameter which influences heat conductivity both in the course of natural circulation of oil in small transformers as well as forced circulation with the help of pumps in big transformers. Viscosity characterizes the oil’s cooling ability and defines its dielectric strength. Hence the importance of viscosity calculation while analysing any operating fluid. Viscosity must be within a certain range (not too high, nor too low) to perform both functions well. It is also important to calculate viscosity change in cold weather, especially if the transformer is operated in the north. Transformer oil density is one of the most important physical parameters of the oil, since many other properties depend on it. As viscosity depends on the crude oil the transformer oil was made from, other characteristics of the oil, in turn, are defined by viscosity, making calculations and quality assessment of the oil simpler.